So it became finally clear to the end, my story of Metta Fock. 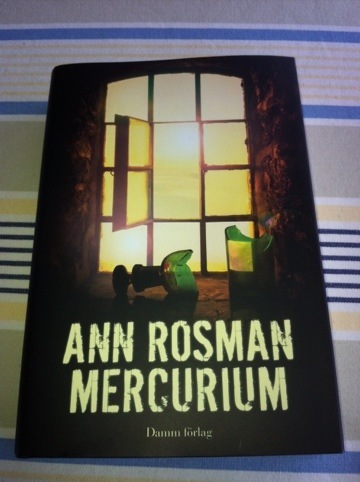 The title became Mercurium which is the old folk name for arsenic. The only female prisoner at Carlsten Fortress, that was how it started, I wondered why she as a woman ends up on an express man's prison. Suspected of poison (with mercurium) on her husband and two of the family's four children, she comes to the barren island of January 2, 1806. I have read the commandant Bonde notes about her. After much searching found his documents on the Regional Archives in Gothenburg. Then Metta arrive in 1806, she has been in jail since November 1802nd And since you get tired of aristocratic lady's many appeals do you solve it by taking away her pen and paper. The only person she can talk to the priest and the only thing he wants to hear a confession. But the noblewoman is brave and proposals. She has to handicrafts and embroidery with crosses the great clemency currently on the Nordic Museum in Stockholm. Actually it's on display right now. Search the "Metta Fock embroidered" to view pictures on it! I started work in February last year and was completed this May ... Lots of paper from the National Archives and provincial archives, which I helped by genealogists Bridget Abrahamsson managed to interpret in an attempt to follow Metta through the legal process. In my parallel story in present time, it is masked in Carlsten Fortress when two of the noble guests is found dead in suspicious circumstances. In addition, the gates remained closed throughout the evening. Detective Karin Adler called to the scene. For there are always links to us living here today. Not only in my imagination, because Bridget did find living relatives of Metta Fock. A certain Cecilia in Stockholm. Who do not have a clue about the story until I called. It feels great to the middle of this murky history find descendants who took her grandmother's grandmother's grandmother Metta to her heart. With the hot hand, we can hand over all our materials with the knowledge that it ends up in the right hands! And maybe that Metta in any way by the time period knows that Cecilia and I were together at her house Little Gisslared, sat in her cell in the Commandant's House at Carl Stone and admired her embroidered clemency. I hope so.